Despite what looked to be a fight that was on the ropes throughout Memorial Day weekend, Zab Judah eventually landed his opportunity against fellow junior welterweight beltholder Amir Khan for July 23rd at the Mandalay Bay in Las Vegas, in a bout to be broadcast by HBO. Judah never believed the fight had truly gone by the wayside. "Nah, one thing I knew about this fight was that it was not a fight that Amir Khan himself wants. I understand this is a fight the network wants; this is a fight his dad wants. This is a fight that everyone else wants," he told Maxboxing on Tuesday evening. "I don't think it's so much Amir Khan that really wants this fight but, hey, the fights made and I'm very happy. I'm very happy." Judah also says, despite how heated he may have sounded as he fought to get a fair deal through the media, he never was all that discouraged by the process. And as he engaged in some 140-character sparring with Khan via Twitter, he never was all that angry or heated. "Nah, I didn't get frustrated; if anything, I tried to control myself because I know how far I can go. I think I made one comment about how if the fight couldn't be made the regular boxing way, then maybe I got to go to L.A. and pay a trip to the Freddie Roach gym, ya' know what I'm sayin’?" said Judah, laughing at the thought. "But y' know, I just calmed it down a little and kept myself professional. These days, I'm a professional athlete; I love what I do. I do respect and respect what I do. I love being the champion; I love what the game of boxing has brought and done for me in my life. "So hey, I'm all in these days." "Yeah, yeah, back in the days, it would've been a little bit different," he admits, laughing at the thought. "I probably would've stepped to him. We would've went to L.A. and made a video." Judah points out that now that he resides in Las Vegas, it's just a four-hour car ride. "But like I said, I don't live like that no more. I live totally different now; I'm very happy in the place I'm in, right now." Judah is no stranger to match-ups of magnitude, having taken on the likes of Floyd Mayweather, Kostya Tszyu, Miguel Cotto and Cory Spinks throughout his career. When asked to compare Khan, he says, "I can't say what it is or what it isn't to become yet. Y' know, when I was a two-time champion of the world, Amir Khan was still in the Olympics, ya' know what I'm sayin'? He turned professional a little bit after the '04 Olympics. 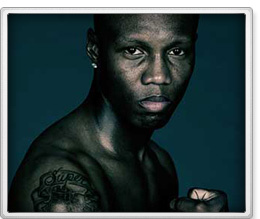 I fought one of the biggest fights of the day with Zab Judah-Floyd Mayweather; that was in '06. So that was two years later. I mean, so by then, I was already a solidified name in the game of boxing. So pretty much, when he came into the game, I was already winning titles, losing titles, winning titles, losing titles. "So I don't know where this fight's going to be rated or how good it's going to be or what. I know people have expectations for the fight but y'know, like I said, we're just going to go in there, work very hard and just let my Lord and Savior, Jesus Christ, dictate my fate." Judah admits that he has, in many ways, underachieved and shortchanged his own natural talent. He's had a very good career, filled with championships and the like but you get the sense he could've and should've done more with his tools. For Judah, this is a significant step in making up for past sins. "Yeah, aw, man, this right here, everything I'm doing, every position I'm in, this is a God-given fight," he says. "You guys know this fight was for Timothy Bradley. Then this fight was for a Golden Boy fighter. So for them right now to be fighting Zab Judah and having no kind of leverage and nothing with Zab Judah, I think I'm in a hellified position." I can be reached at k9kim@yahoo.com and I tweet at www.Twitter.com/stevemaxboxing. We also have a Facebook fan page at www.facebook.com/MaxBoxing.